Beckenham is a district of London within the London borough of Bromley with links to many famous people including David Bowie, who lived locally for a time. He organised and performed at a free, music and arts festival in 1969. This took place in the Croydon Road Recreation ground. The bandstand that he performed in still exists and known as the 'David Bowie Bandstand'. Just to the north of Beckenham town centre, you will find Beckenham Place Park, which interestingly, as of 1995, sits within the London Borough of Lewisham. The grounds here were once part of a private estate, The Manor of Beckenham, where you will still find the grade II* listed building built in the 1770's. During the late 1800s, the railway line was built and this effectively sliced the park in two, creating an east and a west side. The estate changed hands many times over the years and some of the parkland became a golf course. It was also used as a school and a sanatorium before finally being purchased by the London County Council in 1927 and turned into a public park. The already established golf course became the first public golf course in England. During the Second World War, the park was used as a prisoner of war camp and housed many defensive measures such as anti-aircraft battery and barrage balloons. The modern day park covers 96 hectares (237 acres) and is managed by Lewisham Borough Council. On 31 October 2016, in a somewhat controversial move, the golf course and the mansion, which served as a clubhouse, cafe, and toilets were closed by the council. I also hear that tennis courts in the park are due to close soon. The mansion, cafe and toilets are currently being managed by a third party and the facilities may be open, although details are a little sketchy. So in order to get your bearings, the (former) golf course and the mansion are located in the west side of the park and the east side is where you will need to head to if you are looking for Beckenham Place parkrun, which became a permanent event in the park from 19 November 2016. The two halves are only connected via a single footbridge across the railway line so it's important that you know where you're heading for beforehand. 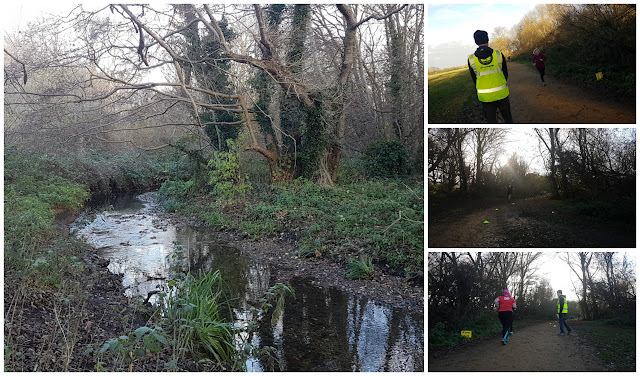 I drove over to the park with Dartford parkrun's event director, Richey, to take part in event number 3 and headed for the free, roadside parking on Crab Hill just outside Ravensbourne train station, which is the most convenient place to park. There is also a small car park at the northern end of the park. From either of these points, the meeting area is just a short walk away. If you travel by train, Ravensbourne Station is the best one to head for as it is the closest, but Beckenham Hill and Beckenham Junction stations are also fairly close by. As for toilets, there are currently none anywhere near the parkrun meeting area. The word on the street is that there are plans for some major refurbishment of the park in the future so hopefully that will include a permanent cafe and toilets within a reasonable distance (see end of this blog for an update). For now, the closest place I can think of if you really need to use the toilet is to use the McDonalds which is located to the east of the park, just off the A21 (we had a pre-run pit-stop here). The course is a flat, clockwise, two-lapper which weaves around the outer border of this half of the park. Underfoot you will find a combination of grass, gravel paths and tarmac paths. In the summer you'll be fine in road shoes, but in the winter you may find trail shoes come in handy as I suspect there will be some mud to negotiate. This was not the first time I had visited the park for a race. 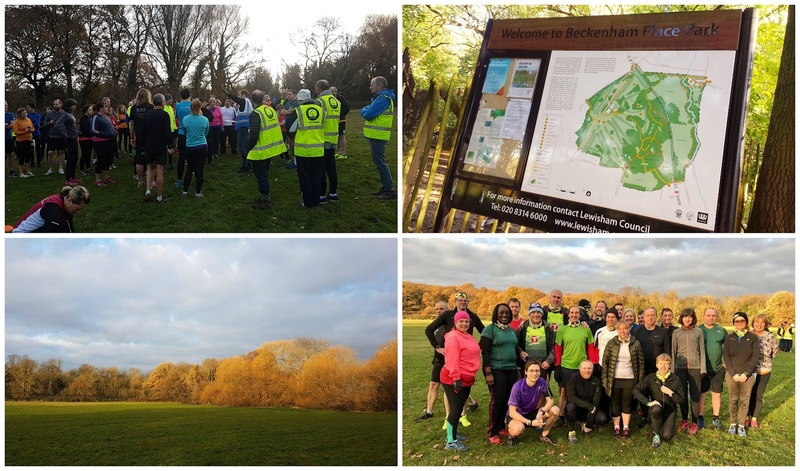 I ran at the Beckenham Trail 10k in 2013 and also at the Beckenham Relay in 2015. After the first-timers briefing the day's 135 runners were assembled on the start line, which is on the grass, for the main briefing. The start is fairly wide and the runners slowly filter onto the adjacent gravel path before reaching the first corner and the course moves back on the grass. On the far side of the field, the course runs adjacent to the train line where every now and then a train thunders (or, more likely, crawls) past. Following the natural grass path and the cones which had been laid out beforehand, the runners soon reach the gravel path again where they switch from the first open grass field to the second via a small two-way gap in the tree line. There are more cones to follow as the course progresses towards the northern end of the park. Eventually there is a sharper right hand turn and the course moves onto a tarmac path for a stretch. Now heading back in the direction of the start/finish area, the runners soon rejoin the gravelly path and this is adjacent to the River Ravensbourne which rises just south of Bromley (it also runs through Norman Park, which is home to Bromley parkrun) and flows all the way through South East London until it meets the River Thames at Deptford Creek. After following the windy path for a bit, they soon reach the two-way section through the trees and they are back in the first open section of the course. On the first lap, the runners simply follow the gravel path and continue on for a second lap. At the end of lap two, they peel off of this path and follow the cones on the grass into the finish funnel. The barcode scanners can be found positioned strategically at various points after the funnel. With that done, it's time to have a chat or cheer in the rest of the day's participants. The day I visited was quite a sociable one for me as there were a lot of familiar faces due to a couple of landmark runs being run here - this meant that quite a lot of the parkrun touring community had turned out. 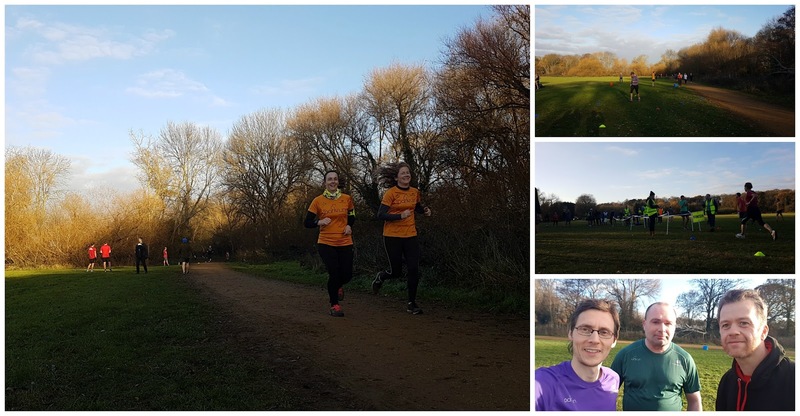 It also marked the occasion of me re-completing the London parkrun Venues set and therefore being once again achieving the fleeting state of being 'Londone'. After the run, we pondered on where to go for some refreshments and after ruling out the option of an alfresco coffee from the coffee hut next to Ravensbourne station, we headed back over to Dartford for some beans on toast in our usual post-parkrun spot. Update: A few weeks after visiting, it was announced that Lewisham Council had been granted £4.9M of Big Lottery and Heritage Lottery money in order to fund a restoration project for the park. It's worth reading the full news story for what the money will be spent on, but it looks like a very exciting time for the park. The project includes a '5km running route', so it'll be very interesting to see what happens over the next few years.